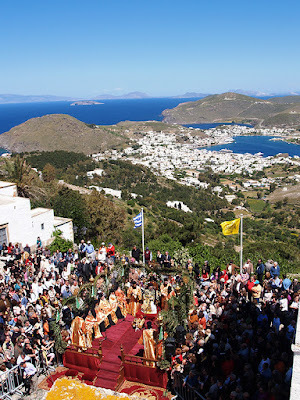 On Holy Thursday, what spurs our attention and our awe is the special ceremony of the Holy WashBowl taking place in Chora of Patmos in the morning, according to the Byzantine traditions, and it is an event that takes place only in Patmos and Jerusalem. Thousands of people gather for this special ceremony. In the afternoon of Easter Sunday, the whole island celebrates the Resurrection together with the visitors of Patmos in the square of Skala, where the municipality and cultural associations of the island offer a rich table with Easter dishes, eggs, Patmian cheesepies and sweets, wine and an impressive show with local dances, which are danced by young men and women of the island dressed in the traditional costume of Patmos. The ritual of Easter ends on Bright Tuesday with the procession of the holy icons in the houses of every parish, in order for every house to have the God’s blessing. The icons of the Holy Monastery are transported to the square of St. Levia in Chora, while the abbot sanctifies, and the monks venerate the relics they have brought with them.